Despite the different theories on its origin, the mid-autumn festival and its indispensable treat – moon cakes – have been well loved and practiced for several hundred years. The mid-autumn festival, which is believed to originate in China and celebrated by many Asian countries, including Vietnam, falls on the 15th day of the eighth month on the lunar calendar. The festival falls on September 8 this year. According to Chinese folklore, there are several explanations on the origin of the mid-autumn festival and mooncakes, which boast a unique, sweet flavor and are diverse in shapes, sizes and fillings. In feudal times, Chinese emperors would traditionally perform praying rituals to the sun in springtime and to the moon in the fall in hopes of auspicious weather, prosperous crops, peace, and wealth. Locals thus considered the 15th day of the eighth lunar month the day to pay tribute to the moon god, and offer moon-like round cakes to the god on the occasion. Following the ritual, they merrily relished the sweets and admired the full moon in the company of their dearest ones. Another theory on the origin of the festival and mooncakes revolves around Tang Ming Huang (685-762), one of China’s Tang Dynasty emperors. Once, while taking a stroll in his royal garden, the emperor was taken to an autumn-time fairy world by a monk with magical powers. Back in his palace, wistful of the fairy scenery, the emperor ordered that locals hold celebrations to mark the special occasion every year. The emperor and his favorite royal concubine also relished mooncakes and wine together during the moonlit night. Despite the different theories on the festival and mooncakes, it is celebrated annually in China, Vietnam and other Asian countries, and its significance remains intact over several hundred years. 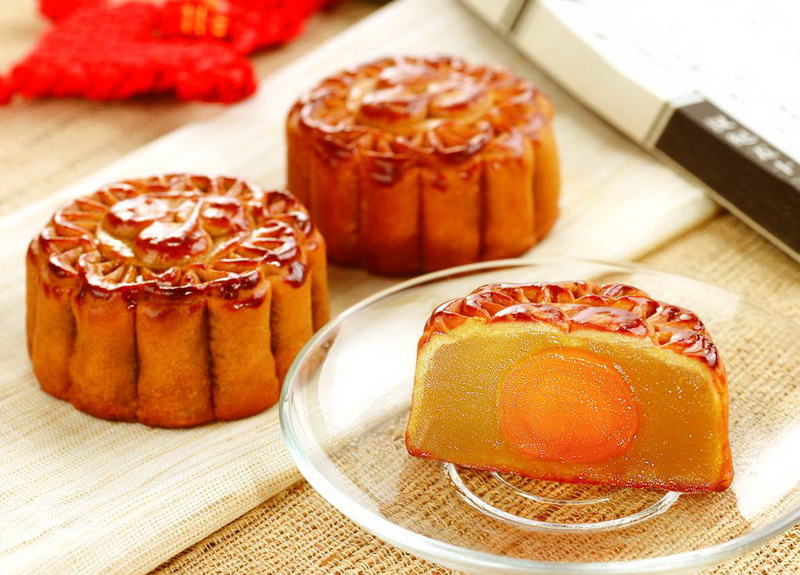 The fest is considered a special occasion for family reunions, and the original round shape of the mooncakes is also indicative of the meaning. During the celebrations, family members habitually get together, make offerings to their ancestors and delightedly enjoy mooncakes over fragrant tea while admiring the full moon. Meanwhile, kids typically hang around with their well-lit lanterns, chanting traditional moon-welcoming songs, and playing traditional games. Over the course of time, mooncakes now presented to relatives, friends, and colleagues as a token of love, care, and gratitude have seen major changes and additions. In Vietnam, just like in other Asian countries, many varieties of the original mooncakes have been produced and well embraced. Apart from traditional “banh nuong” (baked mooncake) and “banh deo” (sticky rice mooncake), mooncakes are now shaped as cute animals or come in other nice shapes. Fillings also include new ingredients, ranging from expensive ones such as fish fins to fruit, jelly, and ice cream, in addition to the traditional mung bean paste, salted eggs, Chinese sausage, lotus seeds, and jam. Some bakeries have also come up with moon cupcakes, bringing a fresh breeze to the traditional market. Diet and vegetarian mooncakes can lighten up diabetic, overweight, or vegetarian clients’ taste buds while maintaining their health and eating habits. Though most local mooncake producers now prefer to make the cakes on an industrial scale with modern technology, a number of small-scale producers and households still use the traditional wooden molds to make the sweets. In Hanoi, artisans on certain streets still manage to retain the time-honored craft of mooncake mold making. Such handmade, dexterously crafted molds can be found before and around the mid-autumn festival in such areas as Hang Quat Street and Dinh Quan Village in Thuong Tin District. It takes patience and high craftsmanship to saw wood and chisel it into intricate carvings, especially with molds for mooncakes in animal shapes or other technically demanding designs. A number of housewives have now chosen to buy the molds and make homemade mooncakes of their own to ensure food hygiene and suit the tastes of their family and friends.